from bon appetit to bon scrapatit! Hi y'all! Hope everyone that celebrated Thanksgiving is home safely and has digested thoroughly! I'm just out of the kitchen, after being held hostage for the better part of the past five days! Our house has been full and so have our tummies! Friday was filled with leftovers and transporting kiddos to-and-from work. Come Saturday, I was making homemade turkey soup from the remains, which we have dug into for the second time for dinner tonight. Yesterday, I made the best batch of split-pea soup to date and we just finished that off for breakfast this morning! Yup, we are trying to stay healthy over here! My baby boy, John, had Robert pick him up from work early yesterday complaining of tummy issues. Oh my, the poor boy was sick from the time they came through the gate until sometime late last night. Not sure if he contracted a bug or a food-born illness. Either way, it was not a pretty sight! And, of course, in between all of the above lots of football and Christmas movies have been watched! LOL! I'm in here for a quick post (okay, y'all know I really, really try to be brief sometimes *wink*) to let y'all know that I'm still not finished with *A Thankfall Heart* and I wish to thank you all for helping me out with some suggestions! Tomorrow is December 1st and the kick-off of this year's *Worldwide Christmas Scrapbooking Freebies* event, so I am focusing on getting my contribution together for posting tomorrow and then I will follow up with *A Thankfall Heart*. Happy December everyone and I'll see you back here tomorrow! MWAH! "a thankfall heart" that needs your help ... please! Yup, this is a never before plea from me. I don't need you to name this kit, I need you to help me complete it! Why? Hmmm ... well, it goes like this. I posted last Monday and then spent the next two days scouting around Scrapland looking for some quick inspiration to help me put together a photo book that must be completed, uploaded and ordered by tomorrow. UGH! It takes me forever to scrap one page (y'all know me now, don't you? :), so I was looking for some templates, but was not finding anything to fit my need until I'd just about given up and called it a night. I think this was late Wednesday night. Anyhoo, I was taking care of some advertising business when I came across some new templates by SweetMade that looked too close to perfect for scrapping my grandson's photo book! I quickly purchased, downloaded, unzipped and took a closer look. WOW! I love them! And ... they are gender neutral, are fully customizable (PSD files included and you can change colors to suit your need) and even include a cover and back page, not to mention at a price I could afford! I was so stoked. Still am! So, what kind of help do I need from you all? I like, uhm ... so need you to help me finish *A Thankfall Heart* so that I can have it posted for you either Tuesday or Wednesday! That is, if y'all would like to have it! 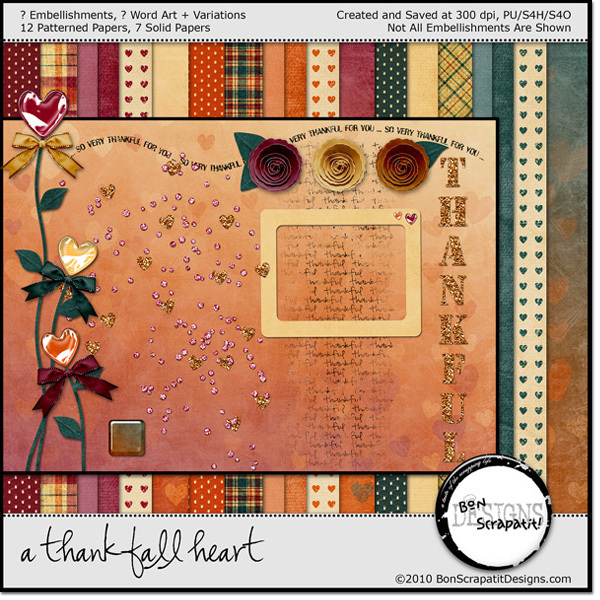 Leave me a comment as to whether you wish me to finish *A Thankfall Heart* (a Thanksgiving gift from me to you) and what you might wish to see me add to the embellishments! monday in the marketplace and a freebie! I normally try to scrap a layout with my designs before posting them, but it all took a twist this time around and I decided to scrap Saturday night, after the fact! I have titled my layout, *Onegai*, which means "please" in Japanese. ROFL! Robert was sitting at his computer directly behind me when I played the audio clip that gave the pronunciation. He chuckled and asked, "how many do you own?" I replied, "huh?" You have to know us and the way our minds track and the way we play on words, but I have to admit, it took me a moment to switch gears and get the joke! Listening to the recording, it sounds like the female voice is saying, "own a guy" with a Japanese accent! LOL! So, of course my quick-witted Aries just had to ask how many I owned! HA, HA! You so funny hunny! I have been fascinated with the country, the people, and the traditions of Japan since the third grade! Sitting in a semicircle with my classmates, our teacher would transport us, via a radio broadcast every Thursday morning, to countries around the world. When in the fourth grade, we learned a classic children's Japanese song, "Shojoji", which I am still able to sing word for word today! The same year, in Girl Scouts, I learned to say hello, please and thank you, along with a small sampling of Japanese culture. These are moments of my life that I shall always treasure as I am a lover of diversity. While I've not had the pleasure of visiting this colorful and technically advanced country, it is on my long list of places that I would love to spend some time visiting and getting to know on a more personal level. Onegai! 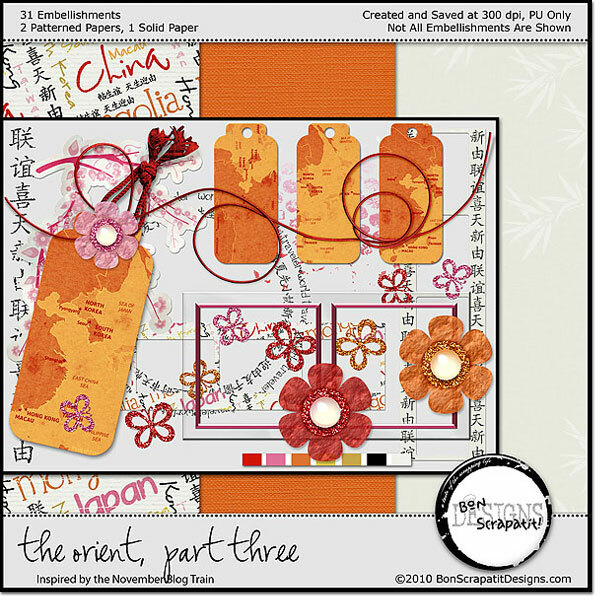 Template is by Kim B's Designs, a freebie on her blog! Yes, I have turned my layout into a scrapatit for you, but first I've just got to share a few goodies I've found while out-and-about in Scrapland! I've been missing my *Monday in the Marketplace* and hope you enjoy it as much I do! Sahlin Studio is on my blog roll. Why? The same reason anyone else has found their way there, I admire their work! Krista has been around for some time and I lost track of her for a short while and just recently found her again. She was just making a move from Scrap Matters to her new home at The Lily Pad! Below is a preview of, *Season of Giving*. Click on the image to be transported to Krista's blog so that you can oogle what has been created with this collection of delectable delights. You will also find the link to purchase if you have been as tempted as I have! Mmmmm ... mmmm! It has a nice Vintage flavor to it, with a dash of modern times. A very versatile kit indeed! "I Am Simply Sarah", who has graced Scrapland for several years now performing her scrap magic in more places than I can count ... on two hands! LOL! This girl can scrap me under the table and around the block a time or two, I tell ya! So, it gives me great honor to introduce to you (for those of you who might not have already had the pleasure) one of Scrapland's and Digiridoo Scrap's newest designers, Diamond Ink Designs! Congratulations Sarah, you have made quite an entrance darlin' and I cannot wait to scrap with *Come What May*! Another fabulously Vintage kit with lots of romance tossed in the mix! It truly warms the heart, doesn't it? 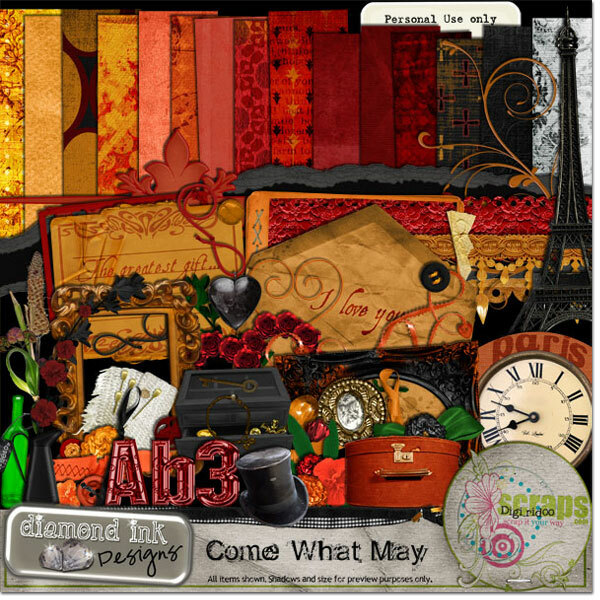 Sarah has introduced her first ever scrapkit at the very low and most affordable price of $3.00! You so rock Sarah! 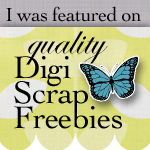 Click on the image above to be whisked away to Sarah's new store at Digiridoo Scraps! My final marketplace find has just made it's debut this very day! 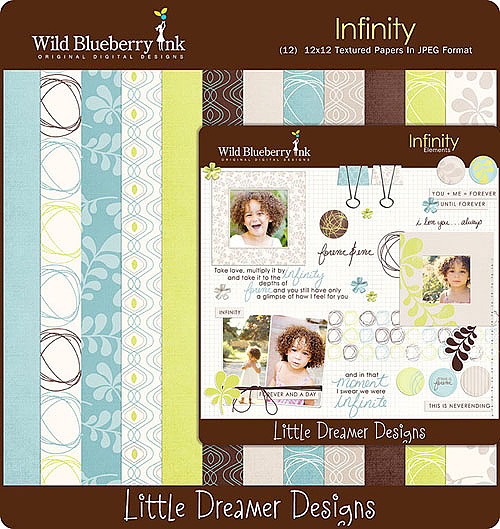 I had a head's up as I subscribe to this amazing graphic artist's newsletter and hope that I'm giving you all a chance to run, not walk, but run to the blog of Wild Blueberry Ink, owned by a lovely lady named Shirley, for a chance to win her newest release, *Infinity*! I am hoping to attend Shirley's chat this evening at 9 pm EST (that will be dinnertime here in California, so I'll have to make dinner early!) over at Owl Tree Studio. She is a bit nervous and I left her a note expressing that she will be in the presence of her Scrapland family and she need not be nervous one bit! Right? Uh, huh! If you are looking for a little girlie chit-chat, some fun and some free goodies, check out the info while you're visiting Shirley's blog and come over and join us! Shirley will be drawing the name of the lucky winner of her new kit, *Infinity* right after her chat! By the way, the model in Shirley's *Infinity* preview is her precious and most adorable daughter, Aubrey. Is not she the sweetest? 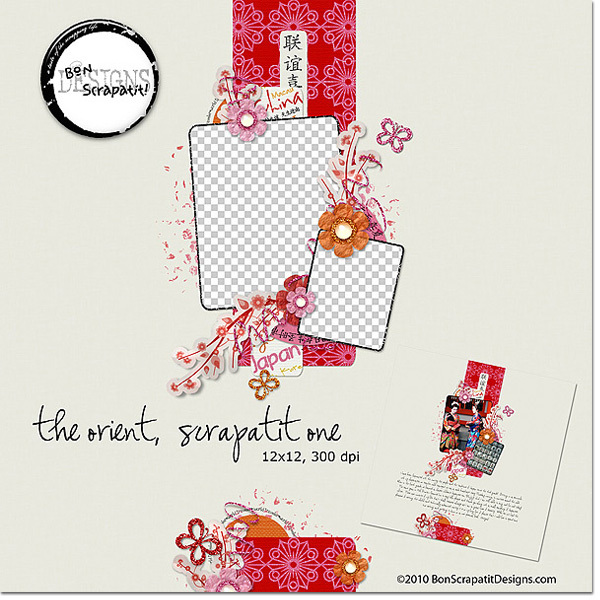 Just a quick mention, lest I forget, I have created a Flickr Group for Bon Scrapatit Designs, where I would love to see you all share any of your projects (layouts, cards, hybrid projects, etc.) that you've created using my designs! There is nothing more rewarding for a designer than to see his/her creations used and I'm hoping that you will find this an easy way to do so here at BSD! It is a public group and all you need do is join the group if you already have a Flickr account. If you don't have an account, it takes but a moment to register. You are then able to add your images to the group pool immediately! I am so looking forward to seeing your masterpieces and I'll leave you some love too! *big smile* I will also make a separate announcement to remind y'all of the new Flickr group! You can also access the group via the Flickr badge posted near the bottom of my blog on the sidebar. Thank you! MWAH! Wishing you all a scraptabulous week! This is one of those times when I believe having a CT is downright necessary! Someone to catch your boo-boos! Yup, I boobed! My little beady, detail-oriented brown eyes missed a typo! In creating a layout last night from parts two and three of *The Orient*, I found my own boo-boo! Ouch! *blush* I cannot tell you how many times I "traveled" around-and-around this word art to make sure all portions were spelled correctly and I still missed my typo! ROFL! If you have downloaded, *The Orient*, Part Three, you will find that the files, LLW_TheOrient_WordArt-2_Original and LLW_TheOrient_WordArt-2_RubOn both have a typo on the left-hand portion of the circle, near the top. Actually, the letter "l" is missing which would make you a world "traveler" as opposed to a world "traver", which I am positive no one has ever heard of before! LOL! I am attaching a replacement file to this post and I have also re-uploaded the entire zip file for part three for those who may come along to download in the future. Sorry for the inconvenience y'all and I hope that you are having a most enjoyable weekend and/or beginning of the week for some of you already! It's Veteran's Day here in the USA and I am so thankful for all who have sacrificed their lives for our country. My thoughts and prayers are with all who have served, who are currently serving and those preparing to serve in our military. Thank you, thank you, thank you! I was hoping to have *The Orient*, Part Three posted a few days ago, however, I am just not able to function when things are in disarray so, I just had to do a little desktop housekeeping before finishing up my final set of goodies that coordinate with *The Orient* - November Blog Train! If you've not hopped aboard this blog train yet, you can find my original post with links HERE. Of course, I just had to Google that Japanese song and I'd like to share it with you, as it just might take one of you for a sweet trip down Memory Lane as well! Pom poko pom no pom. 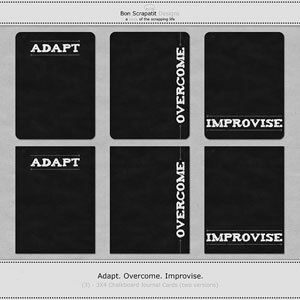 What's up next for Bon Scrapatit Designs? Ho, ho, ho, ho, hoooooo ... wouldn't you like to know! LOL! Okay, I'm in a giddy mood and could not resist a little fun with y'all! *blush* I shall be working on some goodies for Worldwide Christmas Scrapbooking Freebies and getting myself into a festive mood via some sweet holiday tunes while I begin some *Santabulous* designing here in my workshop. Brrr ... the ambience is magnificent and I'm almost sure that I am living fairly close to the North Pole! He, he .. I am also working on my website and store and learning as I go so, if any of y'all have some favorite links to share for building a website/store with Wordpress, I shall be most humbled and thankful if you'll share them! Without further ado, *The Orient*, Part Three! happy dsd and you're being tagged again! I had planned on getting this to you several days ago, along with one more set of tags and goodies in orange/gold/red, however, the 'ol body has not been cooperating with me the past few days, so what better time than on Digital Scrapbooking Day! YAY! For those who have already hopped aboard *The Orient - November Blog Train*, these will coordinate with the pieces you've already picked up! If you've not hopped aboard this fabulous train yet, you can find my blog train post HERE. I can hear everyone's EHDs churning over here with all the amazing goodies you've been downloading all week long! WOOT! 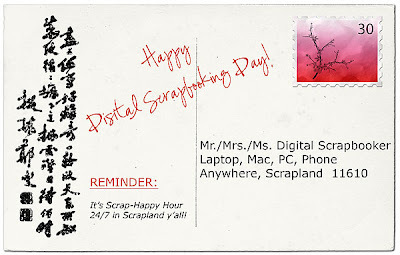 Is not Scrapland the best place to be when in need of increasing ones stash of digital scrapbooking goodness! Uh, huh! Yup, yup, indeed it is! Please find below a link to download *The Orient*, Part Two. Once I created the original Far East map tags in black and gold, I just knew I had to make some in red and pink and then in orange and yellow/gold with red strings for a wee bit more versatility! Hope you find them useful and I'll see you in the next day or two with the final set plus a few other goodies mixed in! 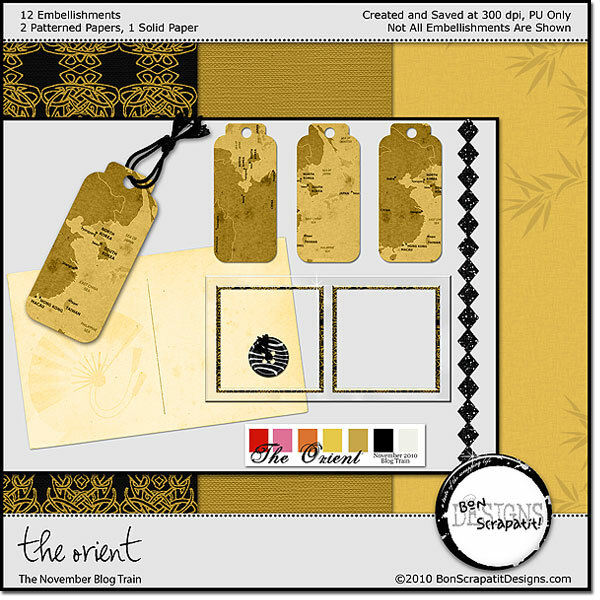 the november blog train has departed ... all aboard for "the orient"! Toot, toot! All aboard for a trip to *The Orient* by way of The November Blog Train y'all! How many of you have been to the Far East - Japan, China, North Korea, South Korea, Mongolia, Hong Kong, Macau or Taiwan? Many thanks to my dear friend Liz in the Philippines for helping me include the proper countries on my little map tags! Nearly 100 designers have worked their magic and are sharing some of the most beautiful and creative works I've ever seen! So, if you've got vacations photos, event photos, family photos, etc. 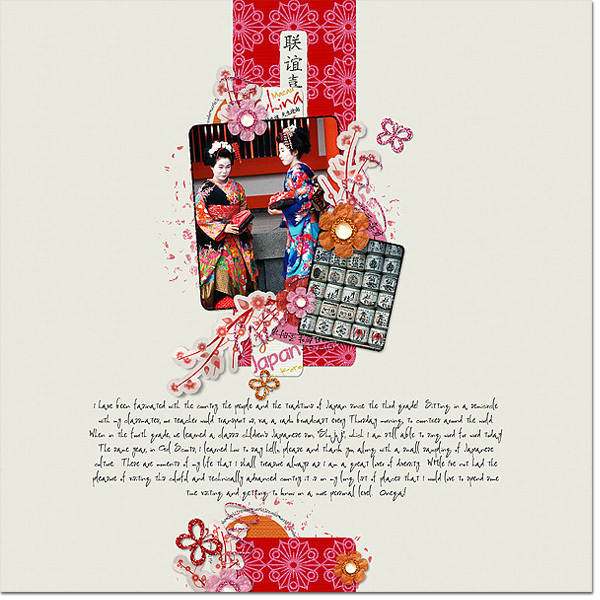 to scrap, you won't wish to miss any of these stunning mini-kits! 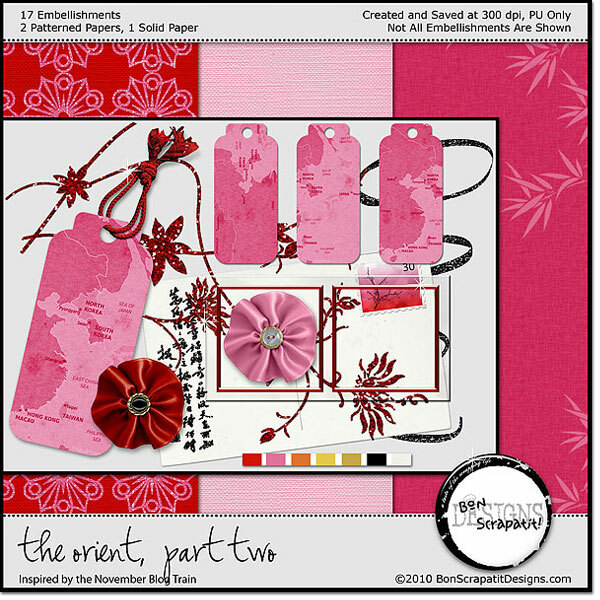 If you've not yet joined The Blog Train Blog on Facebook, I encourage you to do so as Trish is letting y'all pick the new color palettes bi-monthly! Genius idea Trish and I'd say the selections have been amazing, not to mention challenging, which is a good thing! You can find the info for becoming a Facebook fan on The Blog Train Blog. Please leave some love for those you download from as everyone has worked so hard to bring you a plethora of scrapping goodness! Trish works very hard to make this the best train ride in Scrapland so give her some big love too! Thank you, thank you Trish! Remember to give the train 24 hours to complete it's itinerary as we have designers participating from all around the world in multiple time zones!